We just welcomed two 6- month old brothers to The Wildcat Sanctuary. As many of you already know, breeding white tigers is an abusive practice that causes so many surplus orange tigers in cages today. Sadly, the truth is all white tigers are inbred. When we have the chance to remove two white tiger cubs from the breeding pool and neuter them, we do. It’s a big step in the right direction toward ending this cycle of abuse. 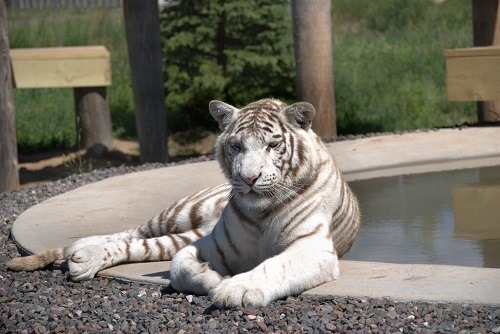 We are so happy the place they came from has signed an agreement to never breed white tigers again!! Shortly after Tonka, Nigel and Ivan arrived, we received a call from an exhibiting facility that needed to place two adolescent white tiger cubs. They explained the tigers had been bred at their facility, but with staff changeover, they had decided to no longer breed tigers. This was a big deal to have a facility no longer breed tigers that would end up as surplus. Of course, we agreed to help as long as they would sign a contract stating they would not breed their remaining adult tigers and, if they had to be placed, they would be placed at an accredited sanctuary or zoo. We were inspired by the facility and staff who were now putting the animals first and really trying to make the right decisions. They could’ve made a hefty profit by selling white tigers and cubs to the highest bidder, but they didn’t. They even set up veterinarian appointments to sterilize the tigers prior to placement. Then it all came crashing down. The zoo staff was informed that they didn’t legally own three of the five adult tigers. It turned out, the parents were actually on a breeding loan from a zoo and the facility did not have the legal right to spay/neuter or place the tigers. This was devastating to all involved, but an all too common practice in zoos around the country. 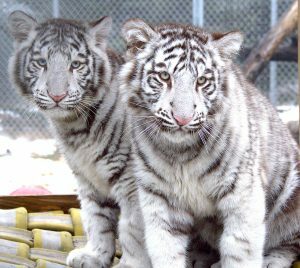 The originating zoo that owned the trio decided they wanted to rehome the adult white tigers to another zoo that would breed them. And worse yet, they said they did not want the third adult tiger who was orange and decided to split up the trio that had always lived together. If we could find an immediate home for the trio together, we asked if the facility could convince the originating zoo to rehome them to a sanctuary? In other words, give the zoo an ultimatum – pick up the tigers now or they can legally be placed at a Sanctuary? 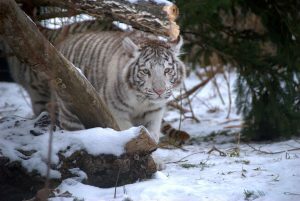 At least this would still give us a chance to place these white tigers and stop the cycle of breeding. As this is being written, we are still in the middle of these negotiations. But, what was to become of the cubs that could indeed be removed from the breeding pool – if we acted now and agreed to take them in? We decided to make the commitment to them and they were neutered before they even arrived. At least we know no other white tigers will be bred by these two, only to be exploited. And, we will continue to fight as hard as we possibly can to save their parents, too. There are so many ethical decisions, legal hurdles, and emotional ups and downs that go into each rescue. But once each cat comes through our Sanctuary gates, we know we made the right choice. We can’t help but think of the saying, “Saving the life of one animal may not change the world, but the world will surely change for that one animal.” We see it every day, as we look at Tonka playing in his first big pile of snow. The decisions are hard. But, seeing the difference it makes for a cat like Tonka who had no other chance, or for the tiger cubs who climbed their first tree today, we know we’re making the right choices for them. And it’s always about them. After a 10-day fundraising event, the Sanctuary is happy to announce the brothers have finally been named. Thanks to the eBay bidding for naming rights, over $3,000 was raised toward their care! Jeremy and Simon growing up fast!